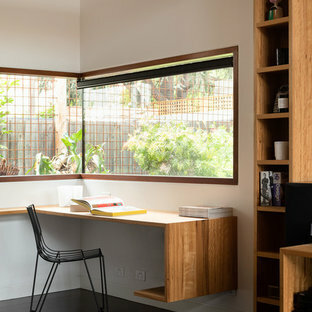 Photo of a mid-sized contemporary study room in Gold Coast - Tweed with beige walls, medium hardwood floors, a built-in desk and brown floor. 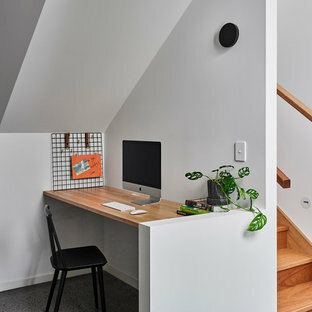 Scandinavian home office in Sydney with white walls, a built-in desk and black floor. 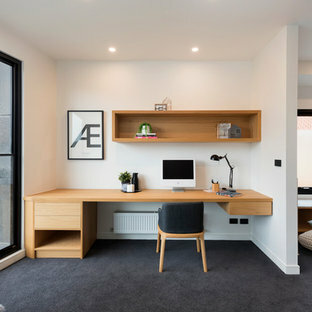 This is an example of a contemporary study room in Melbourne with white walls, dark hardwood floors, a built-in desk and brown floor. This is an example of a small beach style study room in Sunshine Coast with white walls, no fireplace, a built-in desk and grey floor. 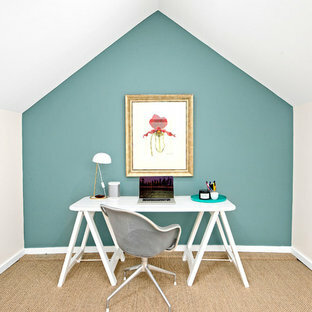 Photo of a small transitional home office with blue walls, carpet and a freestanding desk. 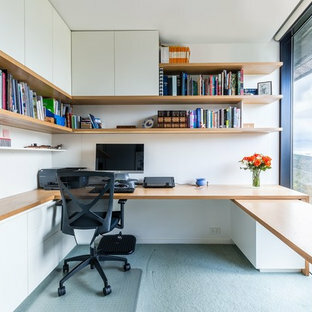 Design ideas for a contemporary home office in Melbourne with white walls, carpet, a built-in desk and black floor. Floor to ceiling compact home office with a rotating desk for optional work space in front of window. Floating shelves and storage above desk. Storage cupboards, file drawer and general drawers below. Recessed LED strip lighting with cable management throughout. Left wall size: 2.2m wide x 2.5m high x 0.4m deep Back wall size: 2.9m wide x 2.5m high x 0.7m deep Window desk size: 1.2m wide x 0.7m high x 0.6m deep Materials: American oak veneer with 30% clear satin lacquer finish. 5mm solid American oak to front edge of desktop. Laminex Parchment Natural Finish 202. Photo of a contemporary study room in Sydney with white walls, light hardwood floors, a freestanding desk and beige floor. Inspiration for a transitional home office in Perth. Inspiration for a contemporary study room in Sunshine Coast with white walls, carpet, a built-in desk and black floor. Inspiration for a contemporary home office in Melbourne. Inspiration for a mid-sized beach style study room in Melbourne with white walls, carpet, grey floor and a built-in desk. Contemporary study room in Perth with white walls, light hardwood floors and a built-in desk. Inspiration for a mid-sized modern study room in Melbourne with concrete floors, a built-in desk and beige walls. Photo of a transitional study room in Perth with white walls, dark hardwood floors, no fireplace and a built-in desk. Design ideas for a contemporary study room in Perth with grey walls, light hardwood floors and a freestanding desk. Traditional study room in Melbourne with beige walls, medium hardwood floors, a freestanding desk and brown floor. 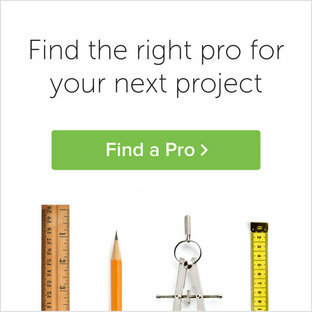 Design ideas for a contemporary home office in Sydney.